This post is sponsored by Colman’s Mustard. All opinions are mine alone. During the spring & summer, I don’t like to spend hours in the kitchen preparing elaborate meals. Instead, I prefer to stick to recipes that are quick & easy to prepare, but are still full of flavor. With two young kids, I am always looking for fun, new ways to prepare chicken. 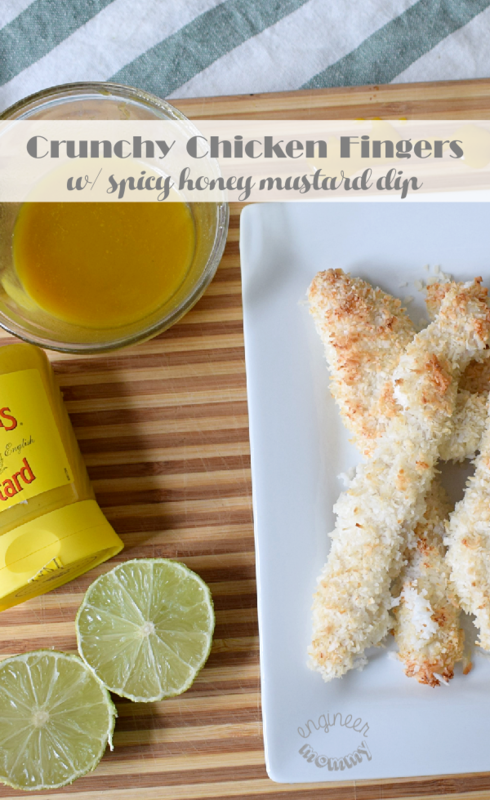 Today, I will share the recipe for Crispy Chicken Fingers w/ a Spicy Honey Mustard Dip. The star of this show is the delicious, flavorful honey mustard dip that is kicked up a notch thanks to Colman’s Mustard. 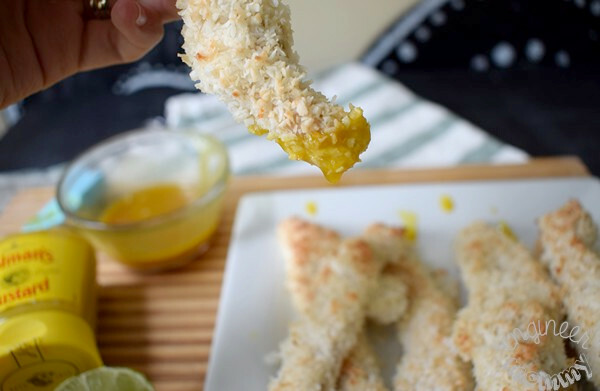 These chicken fingers are not your typical chicken fingers. 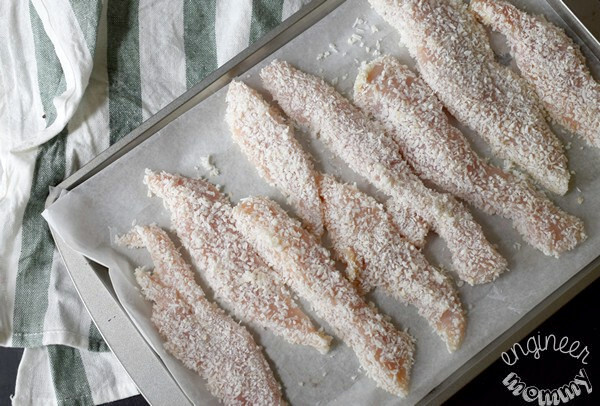 These delicious chicken strips are coated with a shredded coconut layer, giving this recipe a fun twist from the traditional variety. The first step in preparing this dish is to coat the chicken strips. I first poured coconut milk into a small bowl and placed shredded coconut on a plate. I dipped the chicken in the milk and then in the shredded coconut. I placed the coated chicken strips on a baking tray lined with parchment paper. 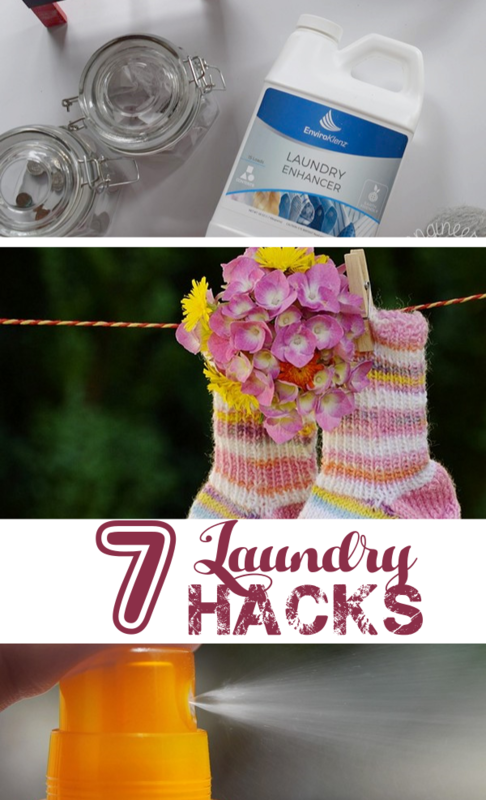 For the complete list of ingredients and full recipe, scroll down to the printable recipe card. I placed the chicken strip in a 375 degree oven for ~30 minutes. Meanwhile, I started to prepare the dip. I added some mayo, honey and lime juice into a small mixing bowl. 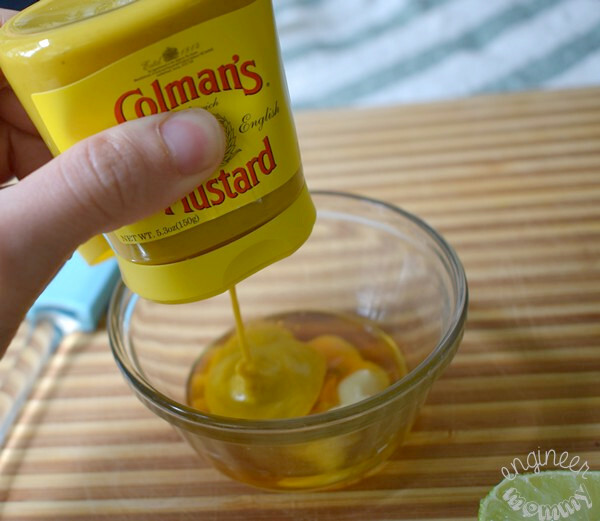 Next, I squeezed some Colman’s Mustard Prepared into the bowl. I am a huge fan of the taste & spiciness of mustard, and this particular mustard is full of flavor. Once the chicken is done cooking, take the baking tray out of the oven. Notice how the coconut crust of the chicken is now golden brown. This spicy honey mustard dip was so delicious. I absolutely love the spiciness of this dip. It makes a delicious pairing with the crunchy coconut-crusted chicken! 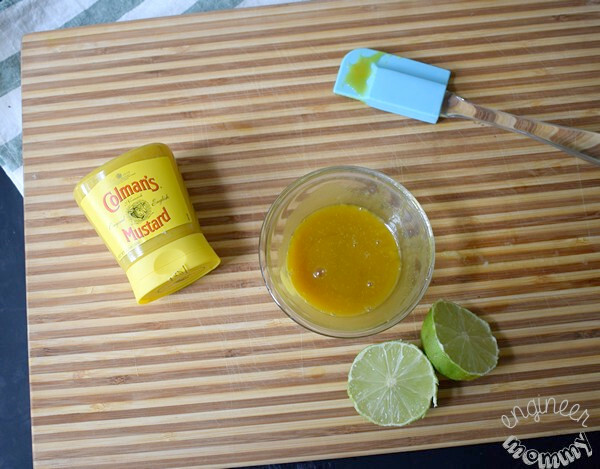 Colman’s Mustard isn’t just a fabulous condiment, but it’s an ingredient that can be used in recipes! 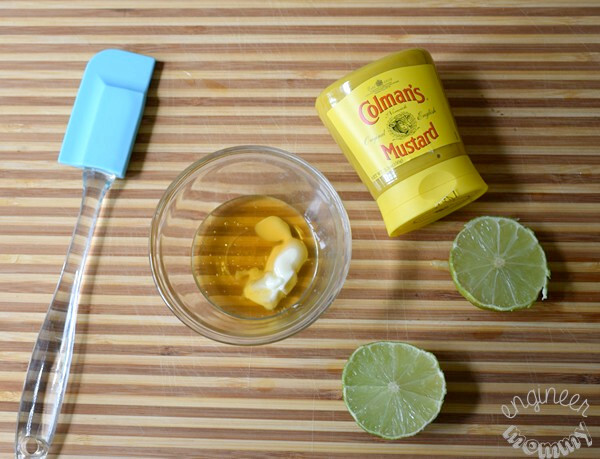 Kick up the flavor on all your favorite summer recipes with Colman’s Mustard. Each bite of the chicken dipped in honey mustard is so full of flavor. I absolutely love the way this recipe turned out and what a delicious flavor Colman’s Mustard Prepared adds to this dish. Want to try this recipe at home for yourself? Print this recipe card below! 2. Place the coconut milk in a bowl and place the shredded coconut on a plate. 3. Dip the chicken strips first in the coconut milk and then in the shredded coconut. 4. Bake on parchment paper-line tray for about 30 minutes, or until chicken is fully cooked. 5. Combine the ingredients for the dip in a small bowl. Mix to combine. Find out why Colman’s Mustard Prepared is the perfect ingredient for bringing your tasty summer recipes to the next level and tell me: What is your favorite mustard-based dip? 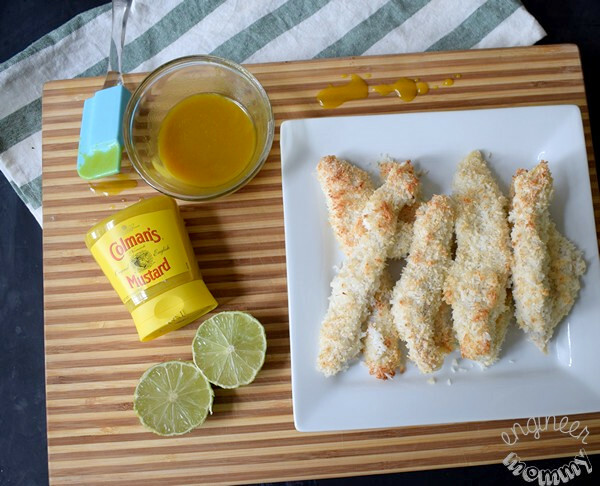 Have you ever made chicken fingers using shredded coconut? Have you ever tried the delicious flavor of Colman’s Mustard? I eat honey mustard on tons of stuff. I can’t wait to make yours. I love stuff with a little kick! These look so delicious! I love chicken fingers and anything spicy so I know I’d love that dip. Yum. Goodness gracious, you just managed to make my tummy growl. These look and sound so delicious, I’ve got to try it. We love honey mustard, the spicier the better. Oh now these sound like a really tasty treat. I can imagine them going really well with some home made chips. Not only do these sound delicious, but I’m so excited I can eat them since I’m allergic to wheat and people often use wheat in chicken finger recipes 😀 Thanks! These sound so delicious! We love all things chicken in our house and the spicy honey mustard dipping sauce sounds amazing. Those chicken fingers look tasty. I’m not usually a fan of pre-made chicken fingers because I don’t like the breading, but this could probably be a contender! Those look fantastic! I would not have thought to use coconut for the chicken fingers, but my stomach is definitely growling! Yum! This looks super simple and healthy! My kids for sure will like the chicken fingers! I will probably just stick with regular honey mustard instead of spicy though for the little ones. This is something the kids will love. It’s great that you have shared the recipe. Thanks! I have some friends coming over this weekend and these would be perfect! I will have to try them out and let you know what I think! I love to make my own chicken fingers. 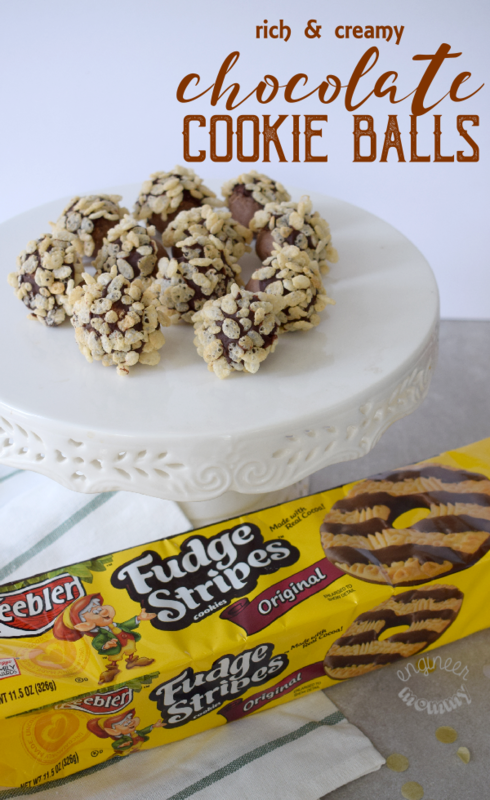 I will have to get the ingredients I need to make these on the weekend with the dip. 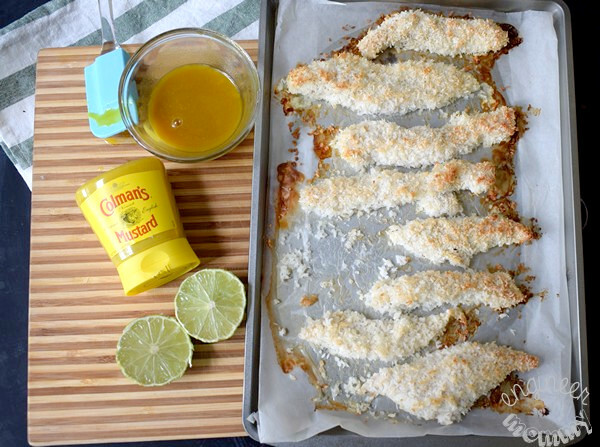 I’ve never seen chicken fingers made with coconut, it’s an interesting idea. We recently were introduced to Colman’s and it really does liven up a recipe. I love the idea of homemade chicken fingers. The spicy honey mustard dip I will make for my family but I don’t eat that kind of stuff. Thanks for sharing the recipes. I really do like your lighter version of chicken fingers. I need to try this out. Honey mustard is one of my favorite dipping sauces. Making that as well. Oh yum! We love chicken fingers, sometimes that is all my kids want to eat. But we have never made a spicy honey mustard dip, sounds amazing! The recipe sounds really delicious and as I like to try new snacks for me and my friends I will put an effort to make this one!! Though, we aren’t a great fan of mustards. I am not a fan of mustards but seems like this chicken is perfectly matched for mustard sauce. I need to try and see the result and I might like mustard from now on. Lol.